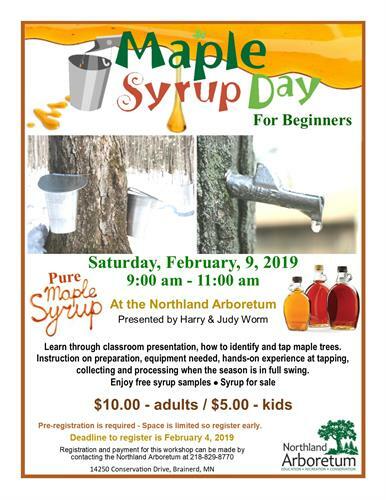 Maple Syrup Day for Beginners will be taking place on Saturday February 9th at the Northland Arboretum. This event will be presented by Harry and Judy Worm. You will learn through classroom presentation, how to identify and tap maple trees. Instructions on preparation, equipment needed, hand-on experience at tapping, collecting and processing when the season is in full swing. Enjoy free syrup samples! Deadline to register is February 4. Regisration and payment for this workshop can be made by contacting the Northland Arboretum at 218-829-8770.